Dr. Mendiguri at work in the village school of Isla. 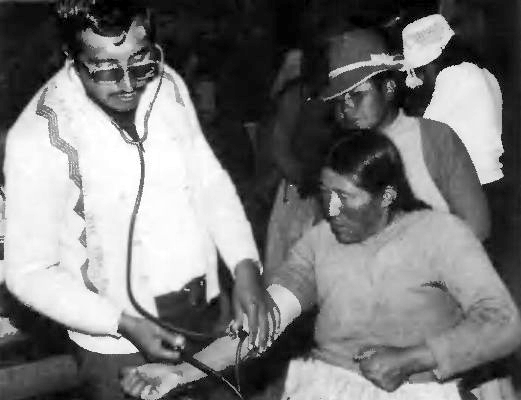 In 1984, Carmella Lim, the missionary to Peru, helped IRFF initiate a medical project in response to the flood disasters in the mountainous area near the city of Juliaca in southern Peru, one of the poorest areas of the country. From their experience working with the severely impoverished Indian people, IRFF decided to organize a team of local medical volunteers to serve the area. So in August of this year, IRFF representatives Christine Jones and Susan Arthur flew from New York to Peru to help the IRFF staff with the project administration. The rural way of life in these Indian communities is very austere. The high altitude and the thin, rocky soil of the region offer limited agricultural opportunities. For the most part the people survive by making small handicraft items which they trade for their necessities of life. But with the small exchange value they receive, the Indian communities remain trapped in a web of poverty, and they resemble the tribal reservations of the United States a hundred years ago. 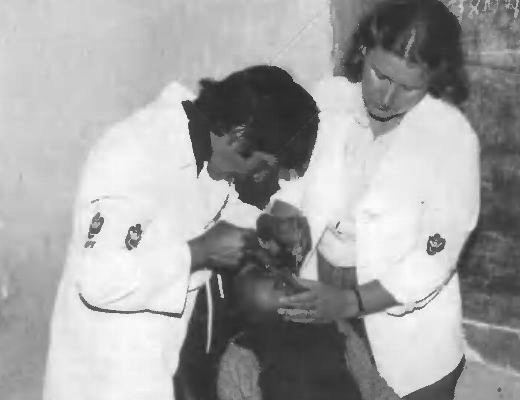 Christine Jones and the Wife of Dr. Ananias, herself a dentist, examine an Indian child's teeth. The people receive very little public assistance. The burden of large families, limited income, and a lack of education inhibits their progress towards self- reliance. The average family dwelling is an adobe but of one room -- without windows, running water, or even the rudimentary implements of everyday life. This unfavorable environment leads to serious health problems, especially respiratory and intestinal diseases. The overall project coordinator, Dr. Betty Cabrejos, arranged for the elementary schools in each district to be the sites for the distribution of supplies and medical services. Early in the morning the people gathered to receive basic food supplies of rice, corn, flour, and sugar. Afterwards, doctors were available to examine them and diagnose their ailments. The doctors instructed the local nurses, who spoke the Indian dialect Quecha, to translate and explain how to use the medicines. Serious cases were referred to Dr. Mendiguri, an IRFF associate at the local hospital in Juliaca. Each day's activities were evaluated by the IRFF staff in the evening to prepare for the following day. The project lasted one month. At its conclusion, the community leaders, doctors, and IRFF staff came together to discuss the future needs of the area. It was suggested that the community immediately follow up on the medical services with the volunteer part-time help of the local doctors who participated on the medical team. IRFF promised to purchase essential medical instruments and supplies and is now looking into ways to provide materials to remedy the pollution of the water supply. Mr. Kawasaka, a professor at the University of Puno who is associated with PWPA, will also start garden plots as a means to instruct the people in how to grow their own crops. Upon the foundation of such service to the community, IRFF has gained the trust of the local people and has been commended by the Peruvian Department of Health for its activities. In conjunction with local officials, university professors, and medical doctors, IRFF is bringing new hope to an ancient land and people.